Defender Ben Mee feels that the ‘miss of the season’ contender from Raheem Sterling was the turning point in the draw against Manchester City at Turf Moor. With the Premier League leaders holding the advantage through Danilo’s strike, the England international had the chance to put the game to bed when Kyle Walker’s cross presented him with an open net. However, the former Liverpool forward somehow managed to slice wide of the post from inside the six-yard box. Mee, who made one appearance for City in a League Cup tie against West Brom at the start of his career, claims that moment gave the Clarets a significant lift. With Johann Berg Gudmundsson going on to score a late equaliser, Mee said: “Yeah, it definitely lifted us. I felt we created a couple of chances before that so I felt we were in the ascendancy and then they go and miss that. “I think it did boost us to be honest with you. You think maybe it is written that we are going to go and get one. 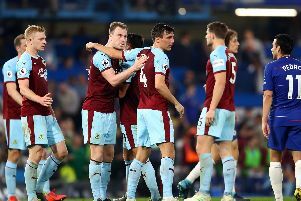 Meanwhile, the Burnley skipper was delighted with the way that the home side stuck it on City after boss Sean Dyche lined up with a 4-4-2 formation. “They’re a top-quality side and we had to work really hard and stick at it. We rode our luck a little bit, but we created some good chances as well. We’re pleased with the point. He added: “We wanted to get after them and try and make things awkward for them. They’re a quality side and they play out a little bit. That’s going to happen. “We took our chances to press them, sometimes they got out and sometimes we managed to put them under a bit of pressure. “We didn’t want to sit back on the edge of our box and invite pressure because the quality they’ve got, they’re going to hurt you. We wanted to try and keep them in their half and press them as much we could. We go about our business the way we do. We don’t show teams too much respect. We don’t see these games as any different to any others.